In collaboration/commission with The University of Alaska, College of Engineering (Anchorage) – Oct.-Nov.
H.M.Metzger & Vaillant, De Oliveira – “The Living Bridge” public video screening. 26 May 2012 … ‎11 of Metzger’s poems will be descending from balloons, upon the city of Nicosia, Cyprus, and performed by actors, musicians, collected and read aloud by the public… We don’t know on which side of the divided city they will land, but we hope their message of unity will be heard by the world. The event (and an interview with Metzger) can be seen live on select European TV stations and online at http://www.ideogramma-cy.com/video.html There will also be a short, live radio interview, scheduled to air on Cyprus radio. Two of Metzger’s poems from the book Why the WilloW (2010) will be included collaborations in September’s forthcoming premiere solo album release by Martin Philadelphy, “TRENSCH“. The album will also feature poetry by another Brooklyn poeta, Jane LeCroy, and the talents of Chris Janka (bass) and Gustavo Costa (percussion) in addition to Martin’s own soulful lyrics and poetry. The “TRENSCH” Tour will commence in Austria with the album release in September. >> A previous, vocal response to Philadelphy’s music by Metzger, “Thursdelay”, was also included in the 2010 album “I Hear You” (Giant Dwarf: Philadelphy & Carlstedt + guests Cuzme & Metzger) available through Philadelphy’s website. This month, Ms. Metzger was also interviewed about her latest book, Eternal Story, by San Francisco novelist Christina Westover. The full dialogue can be read HERE. >> More about Ms. Westover, her book reviews, incredible insight and her latest novel, Precipice, are available through her website. After being incredibly moved by their opening performance for Catherine Ringer last May, Hollace has relocated to Reims to continue full-time development of a theatre project with L’Amour is the Answer‘s frontman Olivier Vaillant. The production will be a type of classically orchestrated rock-opera where the main character ventures on a quest for true love, Metzger’s voice and writing accompanying Mr. Vaillant throughout this narrative. More about L’Amour, including their just-released album “BLIND“, HERE. Please also have a read of the talents of multi-lingual British poet Rehan Qayoom who has just released a new volume of poetry, About Time. The prologue was written by Ms. Metzger as well as the cover of the book donning her painting “Citystorm” (2010). About Time is available through Lulu. >> More about Rehan Qayoom, including his review of Metzger’s latest book Eternal Story, HERE. In (a new type of) collaboration, Metzger has also begun a new project with film director, producer and writer Jean de Oliviera (Berlin) and Swiss author-composer Henry Hugo. This one’s under lock and key, so that’s that. A previous project with Oliviera, Marta Collica, Metzger and other artists, “5X“, can be viewed on Vimeo. And yes, Canada and Germany are still dancing to poetic fusion in their club scenes! Many thanks to Jeff Gold (Montreal) and Hendrik Vogel (Karlsruhe, Stuttgart) for continuing to mix and spin recordings from “TranSynPhony” this spring/summer, beautifully fusing poetry with soulful house music. We are pleased to announce the availability of all Metzger’s books in San Francisco’s ‘Mission’, the home of fire-eating poetry! Need a T-shirt? Hollace is now featured in the gallery of modern artists claimed by Parisian graffiti artist “PLAZ” as contemporary inspirational figures in modern art, film and literature. 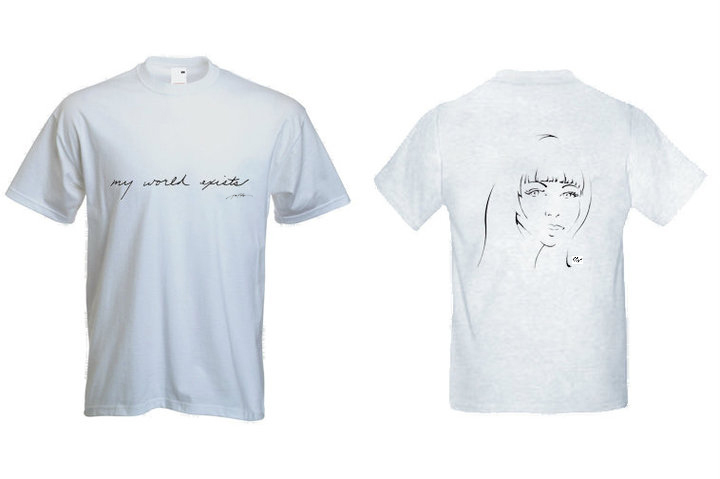 All T-shirts are tagged/painted by the artist, washable and also come in those figure-flattering French female sizes. The “METZGER” design features a portrait by PLAZ on the back (also featured in the book Why the WilloW) and Hollace’s enlarged handwriting on the front, stating “My World Exists”, and is also signed by Metzger. Go to PLAZart for more details and designs to come. First, the Jean Montag / H.M. Metzger collaboration of the poem “Twitch” was featured on BBC radio in April 2010. Hollace and Jean are working on a second piece, their alchemy hopefully resulting in Hollace inventing another language again, or something to that effect. Follow Montag on Soundcloud, Reverbnation, Facebook or MySpace. Next, the Metzger/Hendrik Vogel (Germany) duo were featured in TheBasement podcast showcasing Vogel last May, including Hollace’s poem “Your Eyes Will Change Tonight (and I am not there)”. The two will also extend their growing list of collabs with a new piece due later this season. – Stay Tuned! Finally, a collaboration for the poem “It’s Tuesday and New York is Alive” with Dynamic (UK) is nearing it’s close and will be featured on this website shortly. This poem captures the essence of New York’s underground passages, chance meetings and, together with the music, the essence of the city’s living movement that makes it all happen. “While reading Transcriptions of Time by Hollace M. Metzger, one has the feeling of witnessing history in the making. Her emotionally descriptive prose proves that she is one of the greatest existentialist writers of our time. Transcriptions of Time is a journey without a definite destination, an open-ended book, because time is infinite. Brutally honest, the richly colored prose paints living breathing pictures, and makes tangible the intangible. Written from the viewpoints of various cities, one experiences the feeling of being invisible, insignificant, yet free all at once. It is a tale of remembrance, bringing to mind the various individuals a person comes into contact with in a lifetime. It beckons one to remember the sacred ancient places in this world now hidden by factories and concrete–for they still stand, and magic is all around us. Last but not least, the POSTCARDS FROM PARIS CONTEST has come to a close. Thanks to everyone who bought books, downloads, dvd’s and entered the contest, and Thanks to Her Circle Ezine for the wonderful interview and everything else they are doing over there. The following contest winners will receive a hand-written postcard from Ms. Metzger. The runner-up (2) will receive a signed photo-art print. The Grand Prize winner (1) will receive a signed photo-art print, a “My World Exists” T-shirt and a signed copy of Why the WilloW. I do not want to emphasise the “modernity” and “now” of Hollace Metzger’s poetry, an American poetess living in Paris, but there is something that roots though her feet and grows branches out of her hands. First some facts about the Willow Tree. The Willow Tree is cross fertile with many hybrids. The Willow Tree’s Latin name is Salix sepulcralis. It is a cross between the Peking Willow (Salizbabylonica) and European White Willow (Salix alba). The trees roots are remarkable for toughness, size, tenacity to life, with roots readily growing from aerial parts of the plant. It has both male (staminate) and female (pistilate) flowers which make it diocious. These flowers are known as catkins, which appear either just before or with leaves in spring. Its fruit is dispersed widely on the wind. The Weeping Willow is planted on the borders of streams so their interlacing roots may protect banks against the action of water. They notoriously block French drains. Poem titles add to the mirror theme of the opening poem. A poem has a title “Looking Glass” which automatically suggests Lewis Carroll “Looking Through The Looking Glass” and his mirror theme of opposites, time running backwards, poetry of Jabberwocky that can only be read if held up to a mirror. Hollace also alludes in her volume notes to the 2009 animation film ‘Coraline’ an update on the Looking Glass story (Coraline steps through the mirror and is met by evil alternative parents with buttons for eyes), and of course the poem “Whorescope” a running joke on the internet – an instrument like a periscope or telescope- or type of horoscope – to forecast finding of “women” in a particular area of town- but is there also a deeply intellectual allusion to Descartes via Samuel Beckett’s “Whorescope” a philosophical egg riddle poem about time and reality about how a philosopher can only have an egg cooked after so many days after being laid –does that then link to the earth as “ovalyn” (beautiful egg) mentioned later on in the volume –do you know how the roots and branches grow? in a day refusing clouds? Remember the Willow in the opening poem? You can hear her loving heart knocking through her ribs, rooting in her thinking hand, writing down poetry. With its allusion to Ginsberg’s “flower of joy” reversed. Hollace Metzger is still unfinished, her heart knocking through her ribs, her thoughts rooting out of her hand – Poetry. as I exist in this. to a puddlle of vomit. Ah, and with a puddle of vomit we are back to here and now, the modernity. And I am, like the reader, the lover, all roots, and knots, and branches. Here is the French version of the title poem that ends the volume. salut bas avec désir de grandir. Hollace’s poetry is a dying fall, uprising within, fully engaged with the world, getting to know where she has come from – Where art thou, little bird, going to? This January, the Transcriptions of Time (2009) audio book was released as TranSynPhony. This is an unprecedented attempt to record 164 poems in one volume, resulting in 6.4 hours of spoken texts. The title, indicative of Metzger’s rhythmic play with real-time, descriptive storytelling (transcribing), synonym and homophone not only reveals the Author’s desire for readers to interpret her poems in multiple ways, but also how these texts have become “symphonic” and written/spoken in such a way where alliteration, rhyme and tone stress rhythms – whether musical, in footsteps, along the highway or in one’s own heart. “I have been immersed these past weeks in TranSynPhony. Through meditation, the Author was able to better-return to places and times in which the poems were written and, although it extends the recording process significantly, the result is one which is more honest, more specific to place and true emotion. >TranSynPhony is available on DVD(mp3) or MP3-download through Lulu.com. It will also be available as single-poem tracks through the BOWL Record Label storefront this spring. Also this January, the third book of poetry by Hollace M. Metzger was released, entitled Why the WilloW. It documents poetic thoughts through the course of a year in seasons, changes in the environment and personally, in the Author’s life. Similar to Transcriptions of Time and all her art, the passing of time holds great significance – memories pushed into the background, resurfacing, translucent recollections, movement surrounding the observer and the movements she makes in response to this. As Transcriptions follows the Author’s journey from New York City to Dublin, across Europe and into Parisian life over the course of three years, Why the Willow extends through one year and within one country, France. As when a person stops to notice the growth of a tree, new qualities of life become apparent, as does the poetry written in response to it. The photographs within this volume are not so much focused on remembering totality of place as those in Transcriptions, but rather those places’ details, what one sees when he/she is ‘reflecting’ and how what was viewed before can now be seen differently. We can imagine the Willow to be the Author, but it is not weeping in the manner expected. It weeps to create a mirror which reflects something quite lovely to its creator who is, now, a little closer to the ground (See the English/French poem ‘Why the Willow’). It is also quite evident the Author wishes for others to see themselves in this mirror of wordings. > Why the WilloW is available in paperback & PDF-download through Lulu.com. The PDF-download will also be available through Beauty of Washing Lines Publishers this spring. The December 2009 online-edition of Paraphilia Magazine’s ‘Doppelganger Issue’ featured the poems ‘Bottled Soul’ (Transcriptions of Time) and ‘The Seven-Legged Spider’ (Why the WilloW), including some of Metzger’s photography from Stuttgart and Normandy, and will be evolving to its printed existence in March 2010. With much effort put forth by the issue’s guest Editor, Jim Lopez (editor of Antique Children) and all its contributors, it is sure to be a collection rightfully claiming its place on any bookshelf of contemporary poetry. This past January, some of H. Metzger’s photography work from the Venice Art Biennale was published in the bi-lingual Kaiserin Magazine #07 (Paris). She was the runner-up in their annual photo competition entitled “Inclinations and Addictions” where the inclination, here, was represented architecturally and socially, and the addiction was multi-layered views of seemingly infinite art. This edition can be found at most major art galleries and bookshops in Europe, the USA and abroad. More about the competition and its winners can be found on the News section of the Kaiserin Magazine website. The poem ‘Give Me’, from Metzger’s Why the WilloW, will be published alongside her photography in the March 2010 “Issue 1: SPIT” print version of Antique Children Quarterly (US). This issue will also feature notable writers such as: Guillermo Samperio, Michael Wilding, Paul Krassner, Craig Woods, Asher Benatar, James Miller, Ron Garmon, D.M. Mitchell, Sue Fox, Hank Kirton, Salena Godden, Hernán David Camargo Luque, Adam Narnst, Gregory James Wyrick, Chipmunx, Led Zepeletzky,Gint Aras, Rob Plath, Heather Altfeld, John Paul Jaramill, Vincent Portillo, Troy Jollimer, Kathryn Jackson. The Editor of Beauty of Washing Lines, Garry Franks, will be publishing a double-book Review in the next issue of its Quarterly (April 2010), with H. Metzger as a featured Author, containing Reviews of Transcriptions of Time : The Collected Poetic Works and Why the WilloW supplemented by six unpublished poems. This issue will be displaying a cover-portrait of the Miss Metzger (contained in the WilloW publication) by Parisian artist Laurent Plazannet,artwork by Suzanne Partridge and writings by other poets of note. In addition, Ms. Metzger’s abstract paintings will also be featured on the cover of the Quarterly’s proceeding, autumn issue. Also in April, Pirene’s Fountain Poetry Journal (Sydney, Australia) will be publishing the poems ‘Being Pale Next to You’ and ‘Paper Ships’, both following the issue’s theme of “Love” and from Metzger’s books Observing the Labyrinth from Heaven and Transcriptions of Time. Hollace M. Metzger has also accepted a request for publication with nineteen other American poets in the Heliocentric Press Anthology of Contemporary Poetry . Containing ten poems by each author, the volume is sure to be a collection worth investigating as a cross-section of contemporary American writers. The Anthology will be available later in 2010. Netherlandish experimental musician Raymond Dijkstra and H. Metzger will be joining forces soon for their first collaboration. This will be the first time Raymond employs voicework in his compositions thus adding to the mysterious, sometimes haunting tone set by Raymond throughout his numerous releases. Definitely check out Dijkstra’s music when you have a moment. It can conjure up poetry, words, thoughts in anyone’s imagination. Have a listen to the latest collaboration of Poetry & Music with TOHAN, ‘Incantations at San Tomà’. From Transcriptions of Time, the poem was written with nostalgia for a place lived in Venice and with belief in new love acheived in a place of the same name in Toulouse, ten years later. With Tohan’s talents and drifting accompaniment to the spoken text, this poem-song also connects senses of ground-ocean-sky and of weightlessness achieved in them. There comes a day when every Artist meets another Artist whose work expresses something that he/she tries to say in one medium, better said in the other’s medium… This seems to be what has happened in this meeting. H. Metzger and TRAUM Films (Jean de Oliveira) are currently working on a five-part vignette series of poetry/voice and artistic film work which will also employ the musical talents of Italian composer, Marta Collica . This project will incorporate poems from all three of Metzger’s books and experiment with the idea of ‘unfinished thoughts’ and Burroughs’s surrealist “Cut-Ups” tapes (taking it a bit further).